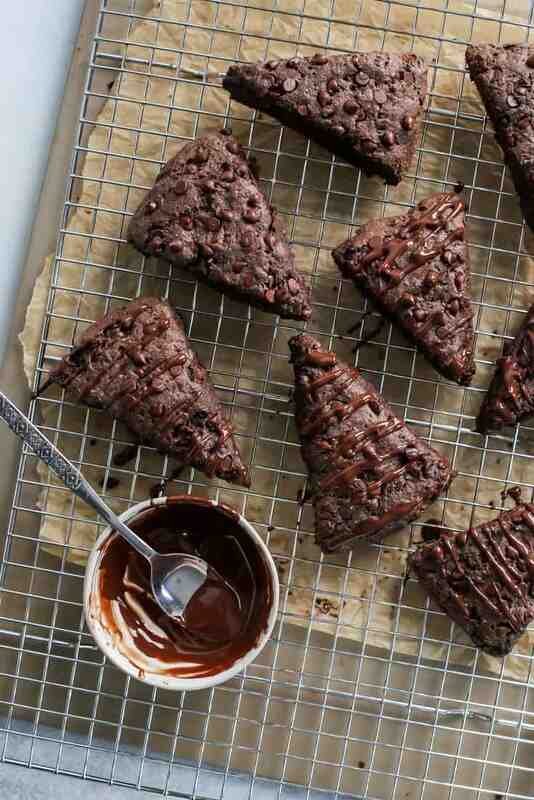 Whole Wheat Vegan TRIPLE CHOCOLATE SCONES. Made with whole wheat flour, coconut oil, lightly sweetened with sugar but loaded with chocolate. Well hellooo there Monday! Did you have a nice weekend? We had Drew’s extended family Christmas on Saturday during the day, and also a little party with the FLEXcrew Saturday night. We wore lovely “ugly sweaters”, drank some dranks, ate fun snacks and chatted it up. Feeling pretty darn grateful. 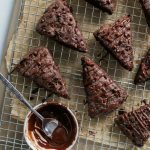 These Vegan Triple Chocolate Scones have been on my list of scones to make for MONTHS. Maybe even a year. Always so many recipe ideas and not nearly enough time to share them all with you when I want to. 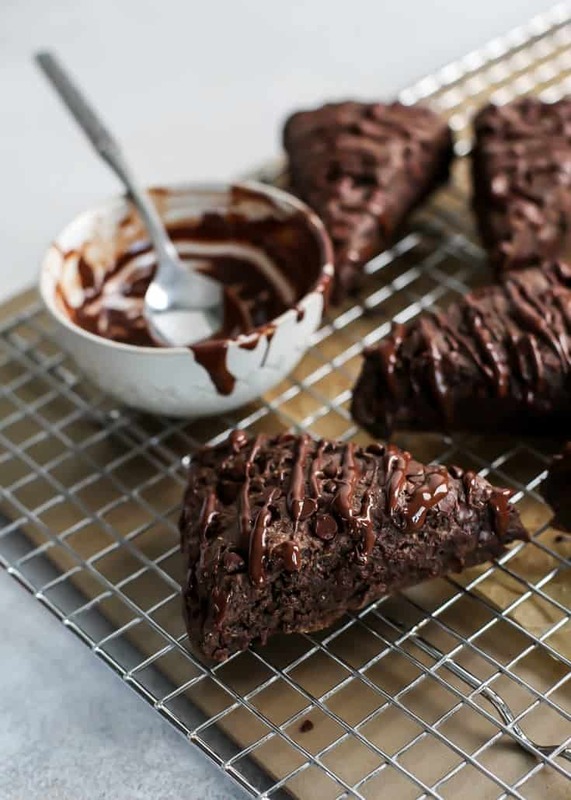 These chocolate scones bring me right back to my study abroad days, when I lived in Sydney and would frequent Baker’s Delight in the mall by the Cole’s grocery store. 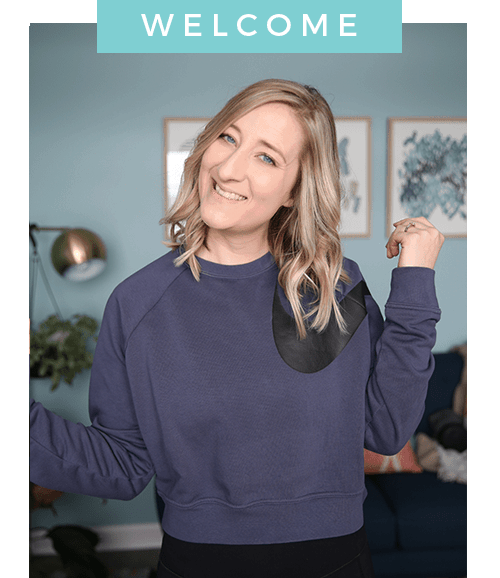 (Any Aussie readers out there?!) I used to take study breaks and find myself at Baker’s Delight picking up a new scone flavor each time I went. One could also argue this was a form of procrastination. The chocolate scone definitely happened more than once though. It quickly became my favorite. I actually can’t recall having a chocolate scone since then… Which is probably why these were on my list of scones to make. And let me tell you, they turned out pretty darn perfect. If you haven’t attempted scones yet, I promise you they’re simple. I’ve been making the scone dough in my food processor now because cutting in the frozen coconut oil is much easier that way (compared to grating it). But if you’re not vegan or dairy-free, you can actually use frozen butter in place of the coconut oil. And in that case, you can also grate the butter in with a cheese grater – see this post for step-by-step photos. But regardless of the method for cutting in the fat (oil or butter) you want to make sure it is pretty much frozen solid – this helps create the slightly crumbly texture you’re looking for in a scone. I also like to bake the scones in a circle with pre-sliced triangles, then during the last 5 minutes completely separate the scones and allow them to bake separated so they get crisp edges. Trust me, it’s an extra little step that is well worth it. Also worth it? The chocolate drizzle on top. 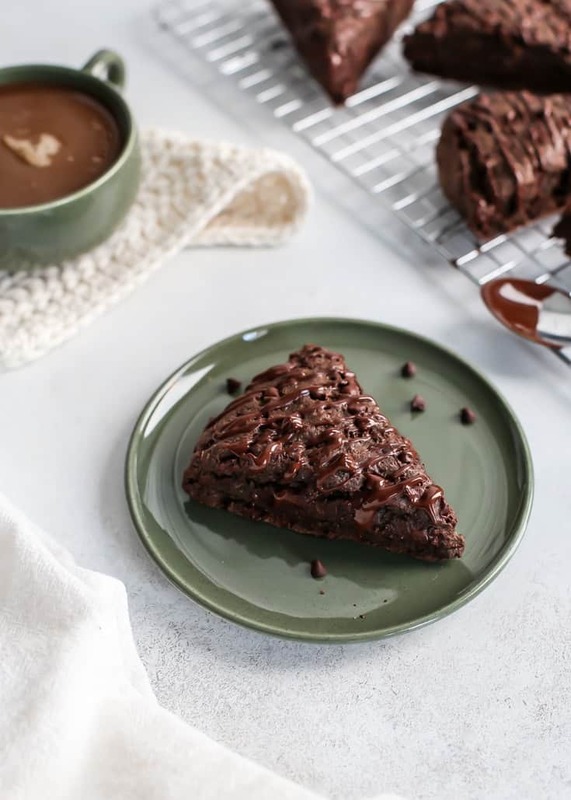 Triple Chocolate Scones that just so happen to be made with whole grain flour and vegan friendly. 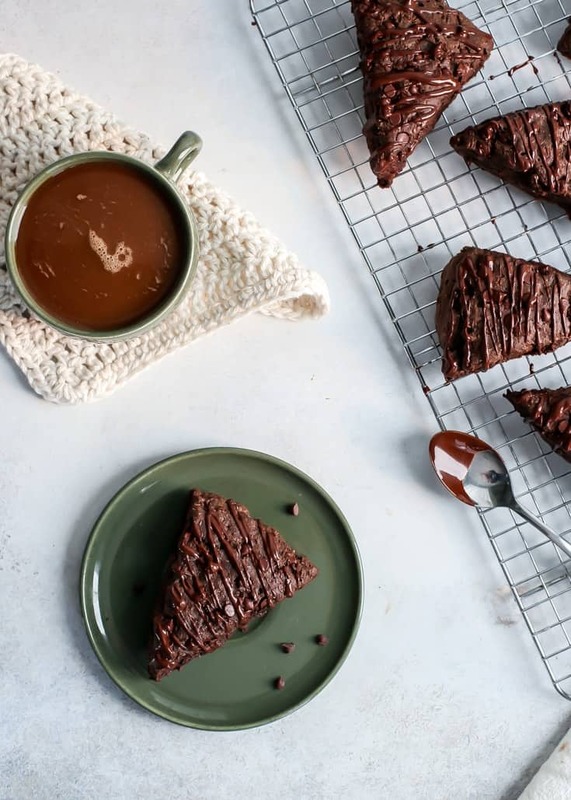 The perfect chocolate breakfast pastry and so good with coffee! These are a must around the holidays. Preheat oven to 375F and line a large baking sheet with parchment paper, or silicone mat. Set aside. In a large mixing bowl–or bowl of food processor–add flour, cocoa powder, sugar, baking powder and salt. Whisk until well combined and set aside–pulse dry ingredients together if using food processor. The frozen coconut oil can either be grated into large bowl of dry ingredients, then blend using dough blender until a grainy meal-texture forms. OR using the S blade of the food processor, pulse the frozen coconut oil with the dry ingredients until broken down into small chunks. Gently stir in the milk being careful not to over work the dough. If using food processor, you can add in liquid with motor running until almost combined. 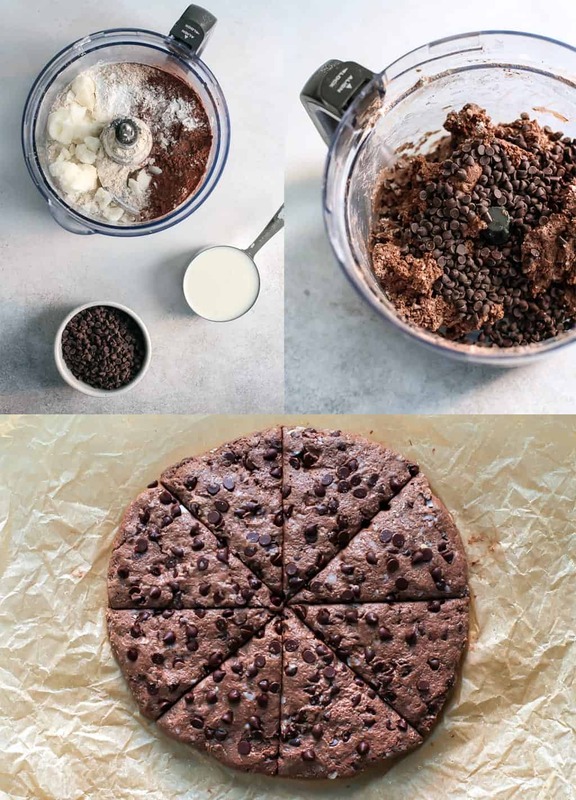 Then remove S blade and fold in chocolate chips using spatula, working dough into a ball. Transfer dough onto prepared baking sheet; shape into an 8″ circle (use flour on hands to if dough is extra sticky). Using a large, sharp knife, make 8 triangle slices into dough. You can also use a mini scone pan. Bake for 15-18 minutes, then remove from oven to re-cut slices and gently pull apart triangles slightly. Bake for another 5-7 minutes, until edges and tops are lightly browned. Let scones cool on baking sheet for 5 minutes before transferring to wire rack to cool completely. 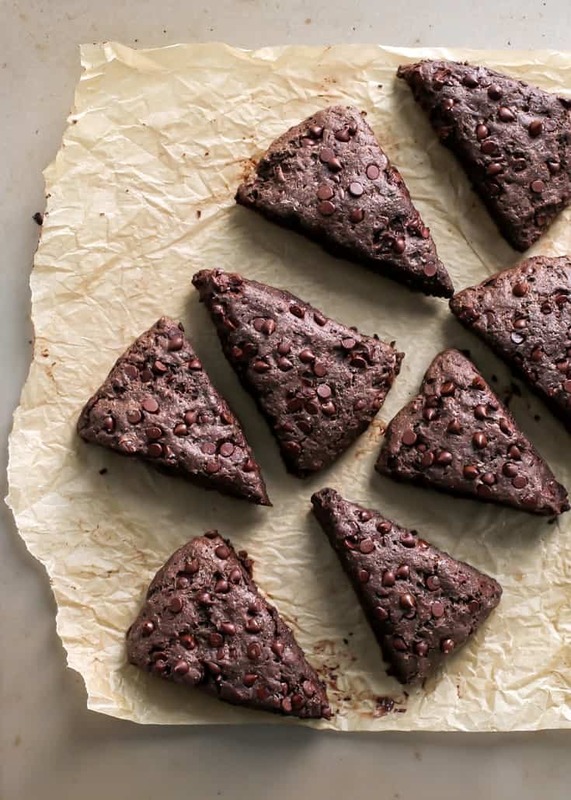 While the scones cool making the extra chocolate topping: in small microwave safe bowl melt together mini chocolate chips with coconut oil in 15 second increment until chocolate is smooth. With scones on lined baking sheet, or cooling rack with baking sheet placed underneath, zigzag chocolate over scones with knife. Allow to set about ten minutes. Scones are best served fresh, but will stay fresh up to 3 days in airtight container. Enjoy! *You can sub half all-purpose + half whole wheat flour if you can’t find whole wheat white flour. A 1:1 gluten-free baking flour blend may also be used, but texture of the scones may change slightly. **You can sub frozen butter if not vegan. You can also grate the butter and use a dough blender to cut in. See this post for more pictures on the process. ***You can use the milk of your choice here, but a lite or ful-fat canned coconut milk will give the scones a richer texture. If looking to cut back on the fat content sub with an unsweetened non-dairy milk like almond or cashew. I MUST give these a try!! These are gorgeous! Do you think I could make this into drop scones instead of making the circle and slicing? Probably! I haven’t tried that myself but I assume biscuit like should bake alright. 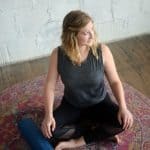 Would love to hear if you try! I tried this recipe, turned out more cakey than scones haha but inevitably they tasted amazing! Going to keep at it to make sure I get that scone texture 🙂 practice makes perfect! I also wondered if you knew the calories for these? Hi Charlotte, Thanks so much for feedback and letting me know how the recipe turned out! Make sure the coconut oil or butter is frozen and you may be able to cut back on the milk a touch – sometimes while working with the dough you may be able to get away with a couple splashes less. Glad to hear you still enjoyed them though!